Lock in a great price for Ramada by Wyndham Pigeon Forge North – rated 8.8 by recent guests! Location was wonderful. Pool area was nice but pool was a little foggy. The staff members were exceedingly helpful. The room was very clean and very comfortable. Are room was cleaned everyday and the staff was awesome!!! Really enjoyed the king-size bed and mattress. 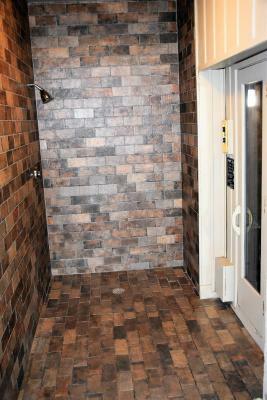 Very comfortable & shower was very large and bathroom very updated. Loved the large selection at breakfast. 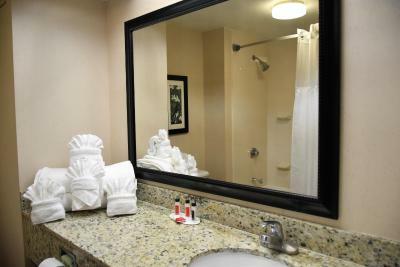 The rooms were clean, the hotel was in a great location and the gentleman that checked us in and the staff was friendly. Loved the cleanliness of the place! The staff was super helpful on what attractions were most popular and how to get there. Most things were within walking distance. Ramada North was in a great location, close to everything we wanted to do. I am an extremely picky person about hotels and Ramada North checked all of my boxes....It was very clean, has an indoor heated pool, (we went when it was still chilly outside) & they had a really good & big breakfast for my 3 kids which took care of 1 meal of the day for FREE. We will definitely stay here again. We enjoyed the indoor pool and several of the restaurants close by. The complimentary breakfast was great. 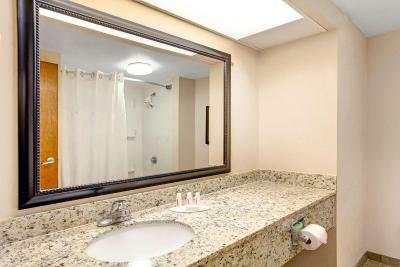 Ramada by Wyndham Pigeon Forge North This rating is a reflection of how the property compares to the industry standard when it comes to price, facilities and services available. It's based on a self-evaluation by the property. Use this rating to help choose your stay! One of our top picks in Pigeon Forge.Offering a complimentary continental breakfast, Ramada by Wyndham Pigeon Forge North provides accommodations within a 30-minute drive to the Great Smoky Mountains. Guests can enjoy an indoor pool, sauna and rooms with free WiFi. A flat-screen cable TV with HBO®, microwave and refrigerator are provided in each room at the hotel. Select rooms also offer a reclining chair and a fireplace. A single-serve coffee maker is provided as is a bathroom with a hairdryer. Guests can enjoy rocking chairs and views of the mountains from the hotel's front porch. There is a business center, laundry facilities and a gift shop on site. This Pigeon Forge Ramada by Wyndham is a 3-minute walk from Country Tonite Theater, a 6-minute walk from Hatfield & McCoy Dinner Show and an 8-minute walk from Zorb Smoky Mountain. Dollywood is 4.3 mi away, while Tanger Five Oaks Outlet Mall is a 2-minute drive away. The nearest airport is McGhee Tyson Airport, 23 mi away. When would you like to stay at Ramada by Wyndham Pigeon Forge North? This room includes a 32-inch flat-screen cable TV with HBO®. A microwave, refrigerator and single-serve coffee and tea machine. An ironing board is provided, as is a private bathroom with a granite vanity and hairdryer. 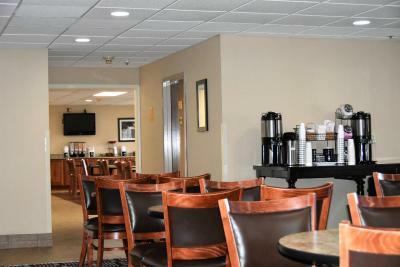 This suite includes a 36-inch flat-screen cable TV with HBO® and a seating area with swivel chairs. A microwave, refrigerator and single-serve coffee and tea machine. An ironing board is provided, as is a private bathroom with a granite vanity and hairdryer. This suite includes a stone fireplace, 36-inch flat-screen cable TV with HBO® and a seating area with swivel chairs. A microwave, refrigerator and single-serve coffee and tea machine. An ironing board is provided, as is a private bathroom with a granite vanity, hair dryer and 2-person spa bath. This room includes a 36-inch flat-screen cable TV with HBO®. A microwave, refrigerator and single-serve coffee and tea machine. 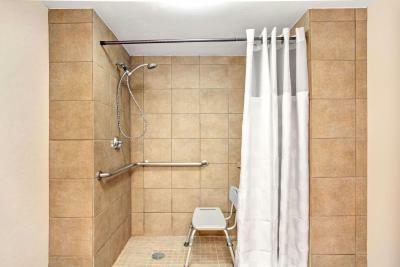 An ironing board is provided, as is an adapted bathroom with safety grab bars, a lowered sink and a raised bathroom toilet. This suite includes a 36-inch flat-screen cable TV with HBO®, a fireplace and a seating area with swivel chairs. A microwave, refrigerator and single-serve coffee and tea machine. An ironing board is provided, as is a private bathroom with a granite vanity and hairdryer. House Rules Ramada by Wyndham Pigeon Forge North takes special requests – add in the next step! Ramada by Wyndham Pigeon Forge North accepts these cards and reserves the right to temporarily hold an amount prior to arrival. Have scrubby hooks in the showers. A lot of people bring there own soaps and scrubbies. The staff was very friendly and engaging. The breakfast is one of the best I have had on any trip. The fridge was not working. Bus load of kids in line to get breakfast and I overheard staff talking among themselves that they weren’t aware they were having a large group that day. I’m not sure they had enough food for breakfast so we had breakfast somewhere else instead of there. The room had a bad odor that would not go away. Everyone we encountered was very courteous and professional. Everything was wonderful, the only optional thing I can think of would be to serve bacon on occasion at breakfast instead of sausage. comfortable & a very nice stay! We were in a handicap room (Room 112). Everything went will and room was nice and clean until the air condition was turned on, then there was this foul odor in the room that kept getting worse each day. I had a headache the whole time I was there and both my husband and myself left to come home on April 13th nauseated. I asked the maid about the odor and she said that room always smells especially when it rains because of the way the wall is made. So why do they not fix the problem instead of having their patrons getting sick. Maybe a more of a selection on the breakfast buffet. But not a deal killer. It is a busy highway. You have to turn to the right out of the hotel and make a U-turn to go left from the hotel, but that's expected in locations like Pigeon Forge. The location is midway so it is convenient for going to Gatlinburg or Sevierville as well as in the midst of activities in Pigeon Forge. There are several restaurants nearby: Local Goat, Cracker Barrell, and some others that you can walk to if you choose. The hotel is CLEAN. The beds are COMFORTABLE, and there were plenty of pillows and EXTRA towels. The room is not super large but it is adequate. The shower spray is perfect. The refrigerator is larger than usually found in hotels. There was also a microwave to use for leftovers or a late-night popcorn snack. The breakfast includes sausage, eggs, biscuits, waffles, bagels, yogurt, toast, English muffins, jelly, peanut butter, sweet-rolls, muffins, cereal, fresh fruit, fruit juices, milk (2% and skim), and coffee (maybe more--that's what I remember). There is also an indoor pool which looked good, and the room enclosure was very warm, but we did not have opportunity to use it sadly. There is a bonus area outside with rocking chairs. We were pleased with the hotel. Our window faced the back side of hotel with a mowed area, trees, and a little-used drive. Not much traffic on that side of building. Great for our first-floor room. It is an attractive white building also. Nothing fancy, but it checked all the boxes. Needs elevator at both ends. Clean and quiet. Breakfast was very nice. The room was nice and food was good.